Drill starts by Green team breaking the puck out and attacking the Red team. After the shot the Red defencemen have to tag up on the ringette line and retrieve a puck for a breakout. 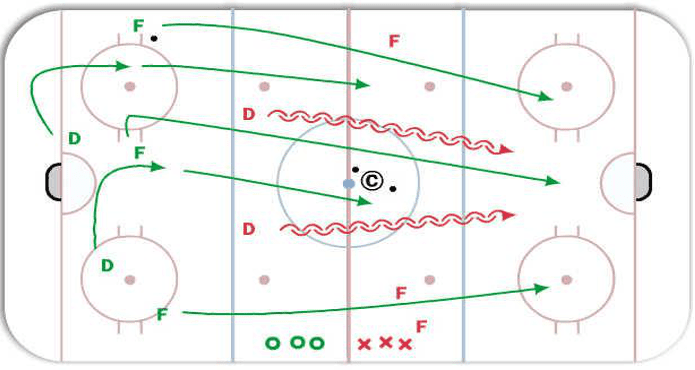 Two of the Green forwards circle around center and then forecheck the Red team. The Red forwards join the Defense and begin to attack the Green Team. Once the puck gets over the Red line the Green Forecheckers are done. After the shot the Green defencemen begin the drill again by tagging up and retrieving a puck for a breakout.